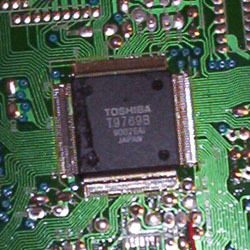 The T9769B chip is the MSX-Engine in several MSX 2+ computers. It is a relative of the T9769C chip used in the MSX turboR. Amongst others the Sanyo Wavy 70FD and 70FD2 have it inside. There is also a strong suspicion that the T9769B chip is used in the Panasonic FS-A1FX/WX/WSX computers, but confirmation is needed. The chip has 144 pins and is a QFP chip. It contains the Z80 CPU, PPI, RTC, PSG and joystick ports controller.